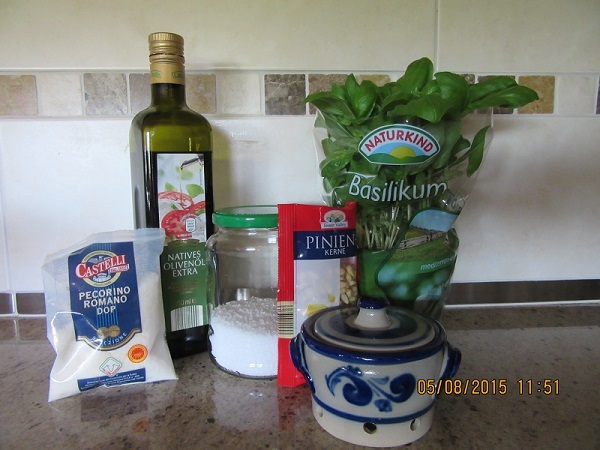 Basil is one of my favorite herbs. The aroma transports me to Rome or at least Connecticut Street in Buffalo, NY and Sunday sauce day. My Buffalo friends know just what I mean! In summer it is so plentiful, whether you grow your own, pick it up at a local Farm Market or buy it fresh at the grocery store, it is a must have herb at my house. This year I have purple basil and a green variety growing in my flower boxes on the balcony along with parsley, sage, rosemary and thyme. Is there a song here somewhere? Every time I walk by the plants, I snitch a leaf or two, crush it between my fingers and inhale the aroma. Then I eat it  Pesto is one of the best uses of basil. A delectable, aromatic mixture of just 6 ingredients, it can be whipped up in your food processor or blender in just minutes. 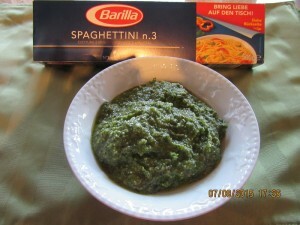 Absolutely fantastic over a plate of spaghetti, served with extra grated Romano or Parmesan cheese. Try adding a couple of spoonful’s to your favorite cold pasta/vegetable salad that you’re dressing with oil and vinegar. Another way I use it is as an appetizer spread. Toast one side of a baguette that has been cut in ½ inch slices. Dab on a little bit of pesto. Add some chopped fresh tomatoes, grab a cold beverage, call your neighbors and sit out on the porch for a social hour before dinner! Just a note on Pine Nuts: In the USA, they are dreadfully dear, but here in Europe they are inexpensive and commonly found. When visiting Rome, I was picking pine nuts off the ground while walking through the Roman Forum! If your budget says “no,” then simply use Walnuts. The results are just as good. By the way, Walnuts are expensive in Europe! Traditionally, Pesto is made using Parmesan cheese. I like using Romano because I think the flavor is a little sharper, but by all means feel free to use Parmesan or even Grana Padano, another hard grating cheese from Italy. 2 large cloves of garlic pressed or minced. By “large” I mean the cloves on the outside of the bulb. ½ cup lightly toasted Pine Nuts. Place pine nuts in a dry skillet and toast over medium heat just until golden, not brown. Takes about 4-5 minutes. ½ cup grated Romano cheese. 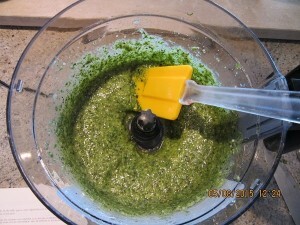 Place the first 5 ingredients in your food processor using the steel blade. Remember to put the blade in first. Guess who didn’t? Place the top on the processor and while the machine is running, slowly add the Olive Oil through the food tube. Process until almost smooth. You’ll want to scrape down the sides a couple of times. Take the top off the food processor and inhale deeply. Knock you off your feet deliciousness! Carefully spoon the Pesto into a jar, making sure you get every last bit. You don’t want to waste any of it. Cover and store in the refrigerator. If you cover the top of the Pesto with Olive Oil it should last several weeks in the fridge, just make sure to add a layer of olive oil after every use. But, I’ll bet it will be gone real fast!